Internationally renowned for his pop surrealist aesthetic, Kenny Scharf’s brightly colored paintings, sculptures and installations mix styles and epochs, often integrating cartoon references from television like the Flintstones and the Jetsons with iconic imagery from art history. With Pikaboom, Scharf presents us with an exploding pink umbrella mushroom cloud. 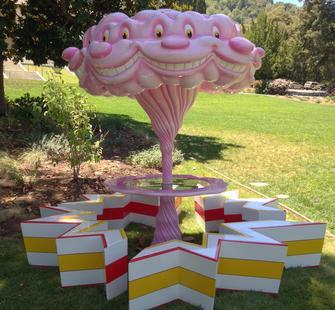 Featuring a series of psychedelic and grinning pink faces floating at its apex, this sculpture doubles as a picnic table of sorts. In the provocative tradition of Pop Art, Scharf weaves playfulness and seriousness together as he humorously depicts a cartoonish atomic explosion. As a nod to one of the seminal figures in the American Pop Art movement, Scharf uses a bold color palette in his four seating elements set around the table that recalls Roy Lichtenstein’s lithograph studies of explosions based on comic book illustrations and his iconic Wham (1963).